Despite several attempts I’ve never tried an British red wine. I’ve had whites at Denbies (having missed the open ‘to taste’ bottles of red by a few minutes and not wanting to spring £15 for a bottle without a taste first) and even some Welsh ‘Champagne’, courtesy of the Sugar Loaf vineyard, but as yet British red has eluded me. 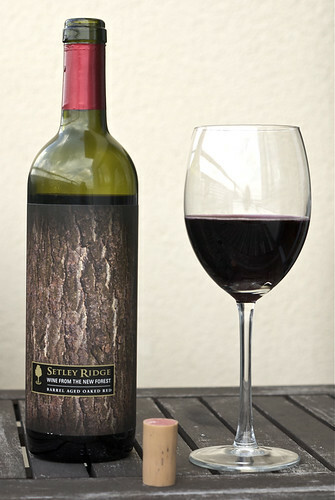 However, knowing this, my erstwhile flatmates, Dave and Let, picked me up a bottle of Setley Ridge Barrel Aged Oaked Red while on a recent weekend amongst the trees of the New Forest. The Setley Ridge vineyard sits between Lymington and Brockenhurst in the middle of the New Forest and has been running under the current owners since 2001. They, as most english producers do, mainly make white wines, with our climate being a bit cool for much red wine growing, with Seyval, Schönburger and Muscat grapes for the white, and Regent, Triomphe and Rondo for the red. Their online list, which claims to be up to date as of 2007, suggests that I got a bottle of their 2005 red (as there’s no vintage on the bottle), which may mean that they haven’t bottled any since then – dodgy weather and the UK’s non-ideal climate may have worked against the increasing demand for British wine. On the nose it has blackberries, pine and some dark woodiness. To taste it continues the theme, with a little bit of wood, blackberry, cherries and then some muddy vegetable notes (that lessened as the wine breathed, become more leafy [rhubarb leaves?] but still quite earthy) leading to a meaty finish. It’s got much more body than I expected from an English red (I’ve been told that they are mainly the lighter red grapes, with Denbies producing a lot of Pinot Noir, as these grow better) and while it’s not one I’ll be seeking out, it’s certainly a smooth and easy drinking red that improves as it breathes. I drank my bottle of this the last few nights and I really quite enjoyed it, so much so that I stopped even thinking of it as an English red so as to excuse it as it plainly needed no excuses.